Newway Towing in San Rafael provides towing services through a network of independent tow truck operators. Our operators are well experienced, licensed and skilled to perform any services for your vehicle. At Newway Towing, we’re dedicated to being the best towing firm in San Rafael. When your car needs to be removed from the scene of an accident, your tank needs a refill of gas or your motorcycle needs towing, you can depend on us. Newway Towing’s team of skilled technicians have years of combined experience delivering emergency towing services in San Rafael. One of the most important parts of great towing services is the way you’re treated. Whether you’ve been involved in a collision with another vehicle, you’re terrified of missing a flight because your tires have blown or you’re stranded in a strange neighborhood in the middle of the night, you’re in a difficult situation. That’s why our expert technicians bring a warm smile and a friendly, can-do attitude to every callout. This makes a big difference to your experience and we’re proud to have built an exceptional reputation among the local community, recognized for our top-level service. Call us for emergency towing, light duty towing, heavy duty towing, flatbed towing, local towing and more! Your car can break down at any time of the day or night, anywhere in San Rafael. Your engine may stop running, your motorcycle could be knocked off the road — anything can happen. Your vehicle and other drivers won’t wait for the most convenient moment to cause problems. And that’s why our team’s available 24 hours a day, 7 days a week, 365 days a year. That’s right: we’re even here for you on holidays too! Our fast response times are another perk of our service: we’re are just a phone call away. No more waiting for hours by the side of the road. No more massive delays. Just outstanding, quick, convenient service. 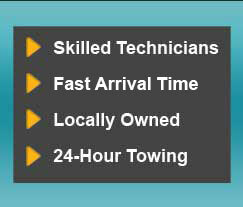 Newway Towing delivers more than emergency towing: our solutions cater to drivers in a huge range of situations. Our roadside assistance services have everything you need to get on your way and back on track — gas refills, car battery replacements, jumpstarts, flat tire changes and more. Our experienced, trained specialists will treat your vehicle with the utmost respect and ensure your car is in the very safest of hands at all times. Locked out of your car? Left your keys in the trunk? Don’t worry! Newway Towing’s car lockout solutions offer expert auto locksmith services like emergency re-keying, key replacement, emergency commercial or residential property lockout and transponder key programming. As you can see, we’ve got you covered in every situation. Just pick up your phone and give us a call! Newway Towing’s team of licensed technicians deliver certified services, operating to the highest standards in every case. Our experts undergo the most effective training and are equipped with the most cutting-edge tools. On top of all this, we keep our prices as competitive as possible — affordable for drivers in San Rafael on all budgets. So, what are you waiting for? Call us on (415) 870-3377 next time you need the professionals!